On a beautiful autumn day in northern California, twenty-one adult participants from Silicon Valley gathered at the Mountain View Farmers Market for a guided experience of fresh, seasonal, and local food. 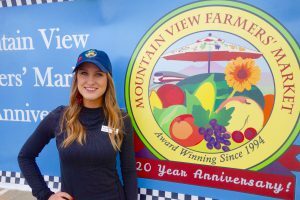 To kick-off the experience, Farmers Market Manager Kayla Hayden introduced the group to the history of the Mountain View Farmers Market and its vital role in supporting a healthy, local food culture. 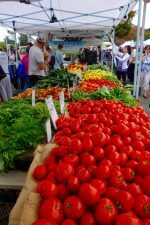 Each week, the market hosts more than 80 farmers and food artisans from throughout the region. Next, the participants self-organized into teams of 2-3 people for a Farmers Market Scavenger Hunt. Outfitted with a clipboard, pencil, and scavenger hunt sheet, each team was asked to complete three challenges: a) interview a farmer, b) find multiple varieties of selected seasonal produce, and c) try at least three “new” foods per person (and suggest a recipe using the food). What kinds of agricultural practices do you use to support a healthy farm ecosystem? 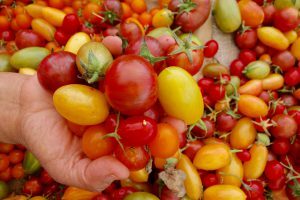 Is your farm certified organic? Why or why not? As they engaged in conversations, participants learned about such farming practices as soil fertility, drip irrigation, cover crops, and natural pest control. In addition to deepening their knowledge about the local food system, each team tasted their way through a cornucopia of seasonal food. Individuals reported tasting such “new foods” as Emerald Beauty plums, Persian cucumbers, Lion’s Mane mushrooms, and Padron peppers. At the end of the thirty-minute scavenger hunt, the teams reconvened to share findings and celebrate the experience. Prizes donated by the market were awarded to the top three scoring teams, and every participant received a canvas tote bag and a certificate for a basket of fresh strawberries from the market.